This week again I was lucky enough to have a YA author give me an exclusive interview! The idea behind the “Writer in the Spotlight” feature is that published (and bestselling) authors are the best source of advice for us, would-be-published writers. Today’s interview is with the amazingly nice Jennifer Bosworth. I did. In fact, I consider it my first memory, just knowing that I wanted to be a writer, because I don’t remember a time when I didn’t want this. I write at home, and I make sure that wherever my husband and I live, I always have at least a nook of my own, if not an entire room in which to write. I occasionally write at coffee shops, but I don’t do my best work in them. I’m definitely a morning writer unless I’m drinking wine or whiskey. I know I shouldn’t say this, but I do my best writing while drinking, but only ONE drink. I don’t want to become a Hemingway. I always have something to say, but I go through periods when I don’t know how to say it. At those times, I usually just start writing and feel my way through. I don’t believe in writer’s block for myself, because I know the only thing that’s standing in my way is me. What do you say to people who want to be writers? How difficult is it to get published? Write for the love of writing, and no matter how artistic you are, don’t forget to at least attempt to find a hook for your story, and don’t neglect plot. “Stuff” needs to happen in a book. Pretty writing will only get you so far. There’s a lot of competition out there, so if your work isn’t exciting enough––which doesn’t mean car crashes and explosions, it means conflict, conflict, conflict, interpersonal, personal, man vs. nature, whatever as long as it’s conflict––you’re going to have a much harder time selling a book. Also, keep in mind that writing is a business, and if editors have no idea how to place your book, you’ll have a hard time selling said book. If they know exactly how to position your book in the marketplace, you’re golden. This sounds depressing, I know, and I have a lot of unmarketable books in me so I understand the difficulty writers have accepting this idea. But if you want to sell, not just write, you have to meet the publishers halfway. Is it better to outline and plot your novel or “go with the flow”? Depends on the writer, but I prefer to write wildly and revise later. Is that the smart, economical thing to do? Not really. It’s much more practical to outline. But the most creative scenes in any book or screenplay I’ve written have always been off the cuff. A good rule of thumb: know where you’re going, but discover the path as you travel. Do you set goals for yourself as you write? I live and die by mini-goals. When I’m working on a first draft, I need to write at least 1000 words a day. I used to do 2000, but I found that after 1000 I wrote complete crap. I also like to give myself holidays as deadlines for finishing an entire manuscript. I don’t know why, it just feels right. To write this book, where did you get your inspiration from? Were you aware of the coming dystopian trend in YA literature when you wrote it? Haha! I hate trends, so if I’d known one was coming I probably would have written a different book. To set a trend sounds great, but I don’t want my book to be an “if you liked this, you’ll love this” sort of book. The inspiration for STRUCK literally struck when I learned a few strange but true facts about lightning and about human lightning rods. I like to base everything I write, no matter how fantastical, in reality. The fact that real human lightning rods exist was jet fuel for my imagination. And I’d always loved post-apocalyptic novels like Stephen King’s The Stand, and wanted to write one myself. A human lightning rod standing between salvation or the utter annihilation of mankind? I couldn’t resist writing that book! I guess I would have written it even if I’d known the dystopian trend was looming. Mia: How did you come up with this character and her power? Again, I try to ground my fantasy in reality, and the human body has a complex electrical system. It stands to reason that we can learn to utilize it in small ways. But what if a human were charged with a LOT more energy than was normal? What could they do then? I regards to Mia’s personality, I consider her my alter ego. I grew up in an extremely religious community, and as a kid I didn’t feel like I was encouraged to think for myself. It seemed like adults were always telling me what I believed as opposed to asking me to decide for myself. Part of the reason I created Mia is because I love the idea of pitting a cynical teenager who doesn’t believe in much of anything against two doomsday cults who are trying to force their beliefs on her. Mia’s dilemma gave me a way to act out my personal angst. Oh, torture. I love music, but I can’t listen to music with lyrics when I’m writing, unless it’s Tom Waits, because his lyrics are more like growling and grumbling than singing. I listened to movie soundtracks a lot, particularly the one for a movie called “The Gift.” It has a lot of creepy fiddle moments. For some reason fiddles inspire me. A couple of novels are competing for my attention. The first is a psychological YA horror called THE HIVE, which takes place in a claustrophobic, small-town religious community, but involves supernatural terrors. I’d say it’s a cross between “Big Love” and “The Ring.” The other book is a post-apocalyptic, fantasy western. 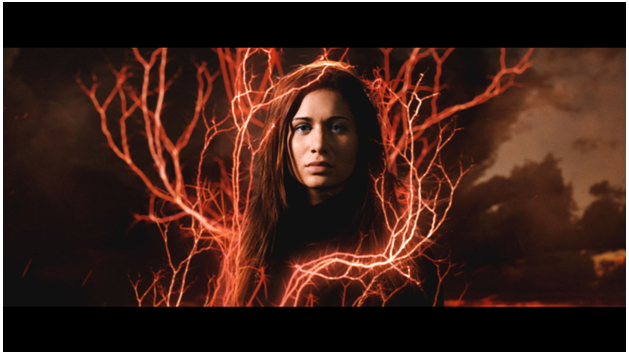 Think “Firefly,” but with magic instead of science. I’m also working on several horror screenplays, which my husband and I hope to produce. Which authors inspire you now? Gillian Flynn, who writes extremely dark, literary mysteries, has been my biggest inspiration of the last ten years. Reading her books makes me a better writer. Adam Nevill, an up and coming horror author (and a UK boy! ), and Joe Hill, Stephen King’s son, are another couple of writers whose books I wish had been written by me. They give me a new standard by which to measure myself, and they make me want to strive every day to be better. Which YA books would recommend? My top 3 YA novels of 2012 are Shadow and Bone, by Leigh Bardugo; The Scorpio Races, by Maggie Stiefvater; and Harbinger, by Sara Wilson Etienne. Each of these authors gave me something the likes of which I’d never read before. I like being surprised. I’m not one of those people who reads the same kind of book over and over again. I need variety, and I love it when authors take risks. But my all-time favorite YA novel, which I think everyone needs to read, is Little Brother, by Cory Doctorow. That one was a game changer for me. It redefined YA literature in a way no other YA novel had done before, and it changed the way I thought about issues like terrorism, privacy, and dissent. 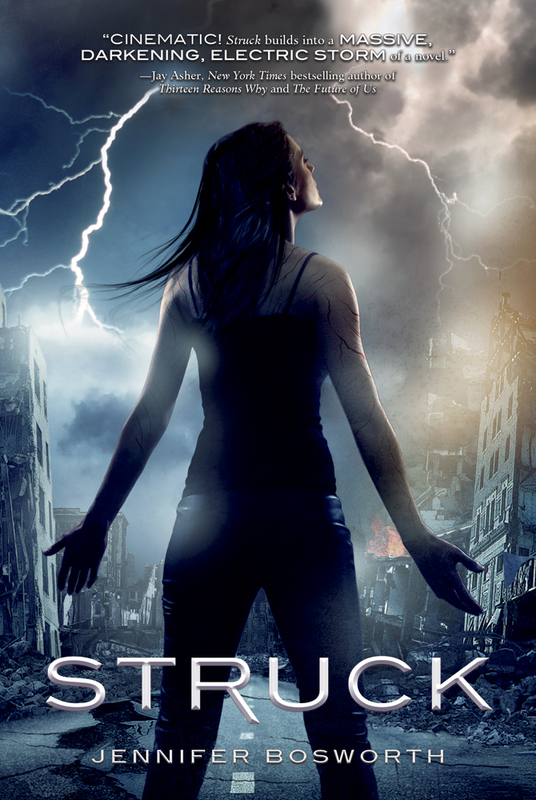 Struck is out now and you can buy it on Amazon. If you’re still not convinced, you can watch the AWESOME book trailer here. This entry was posted in A writer in the spotlight and tagged 2012 debut, a writer in the spotlight, dystopian novel, EM Castellan, fantasy, Jennifer Bosworth, on writing, paranormal, Reading, Struck, YA Books, YA writer's interview, Young Adult literature.